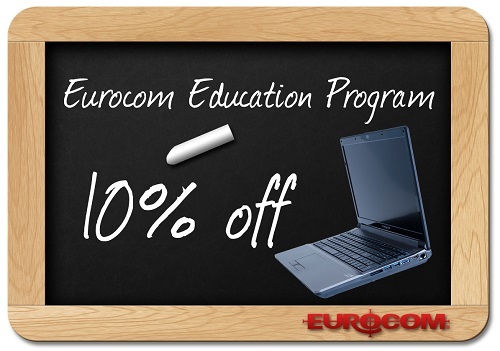 Eurocom is celebrating six wonderful years of the Eurocom Education Program, helping students from around the world obtain the highly capable, upgradeable and long lasting mobile computing for their studies. When a student enters their educational journey they need a companion to stand by them, to be there do-everything tool, to assist them during an all-nighter, to be their crutch that will help them in the darkest of times. Eurocom created the Education Program to assist students obtain the computing hardware they need to excel in their schooling and their lives. For six years students from around the world have been utilizing the Eurocom Education Program to lend a hand during their educational journey and beyond. Students, worldwide, come to Eurocom, choose the perfect laptop for them, configure said Laptops with the components they need, submit their student card or other proof and then wait a few short days for the system to be delivered to their door. Hassle-free. We recognize the challenges facing students today - both in terms of cost and performance. PhD's need high end equipment. Young students need help buying equipment. The Eurocom Student program accomplishes the best of both worlds enabling access to our full line of exceptionally performing, long lasting laptops, at a discounted rate available exclusively to students. With the Eurocom Education program students have access to a full line of upgradeable, highly capable, custom built Ultraportable Laptops, Mobile Workstations, Mobile Servers and Desktop Laptops.